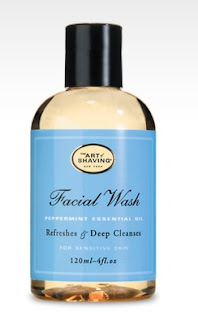 I have always enjoyed the plethora of shaving products that have been around for women. It seems that there are so many options from which to choose and so many brands...it can be overwhelming! Well, for every three products for women, there is one for men and I have to tell you that finding good shaving products for my hubby has not been an easy feat. The fact that he is a picky guy doesn't help either. Ha! First of all, he likes to "soften" his facial hair prior to shaving it off. This process ensures that the hairs won't be so stiff and that he will have a cleaner shave. I have looked into getting him some good-quality face wash to help cleanse while he does this and I have loved what I have found! The product pictured above looks exceptionally wonderful. I love peppermint oil and this would definitely be a fantastic wash to help him wake up in the morning before he goes to work. Second, my husband is really picky when it comes to razors. For the longest time, he used disposable razors but found that they were cutting into his skin and felt very harsh. There always seemed to be stubble left over after he was done so he could not count on a clean shave every time. His skin is also very bumpy and so if he didn't use something for sensitive skin, his face would be bleeding in multiple places after shaving. This was very frustrating and I felt so horrible for him. Now, he uses a much more expensive razor that comes with replacement cartridges so he doesn't have to throw out the razor every time he shaves. It is also very gentle on his skin and keeps him looking good. Who likes to shave without shaving cream??? No one that I know. My husband always used the same brand of shaving cream until I introduced him to a shave gel. I didn't care for the scent of the brand he was using when I met him so I introduced him to my favorite brand and now that is all he uses! Ladies, isn't it great when our men take our advice and use what we like? So, those are just a few products that come to mind when I think about shaving products for the man in my life. He looks so handsome after a fresh shave and I know he feels good about himself when he has high-quality "tools" with which to work.